Story by A’Myri Thornton. Edited by Sean Beach. Photo by Dwayne Smith. MAR. 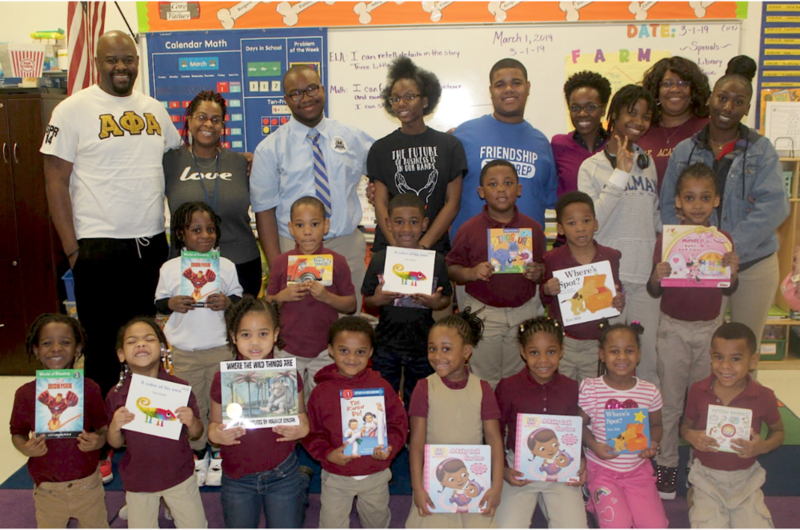 19, 2019: On Friday, March 1, 2019, in celebration of Read Across America, my fellow FNN peers and I went across the street to Friendship Southeast Academy and volunteered to read to students in grades Pre-K3 through 1st grade to celebrate reading and make it interesting and fun for the kids. We went door to door to each classroom and helped the children pick a favorite book to take home. Then we read it to them. Afterwards we celebrated with cookies and cupcakes. Some of the teachers even dressed up as book characters such as The Cat In Hat and Dora to make the kids overall more inspired. I personally enjoy spending my free time reading to little kids because I know that they look up to me and that I can have an impact on their lives. Overall, I enjoyed the experience of being in an environment with little children. A’Myri Thornton and Sean Beach are sophomores, Dwayne Smith is a senior, at Friendship Tech Prep Academy.